Time to dust off the crystal ball and attempt to decipher which freshman sires of 2017 are likely to be at or near the top of the first-crop sire list at year's end. The only certainty in such an exercise is that someone will surprise us. 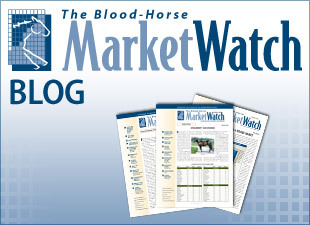 For the past few years, BloodHorse MarketWatch has published statistical profiles of the first-crop sires represented within the top 10% of yearlings sold at auction. These profiles are included in the Jan. 21 edition of BloodHorse on pages 44-46. Early market success is certainly no guarantee of racing success, but the market narrows the field. We then look at other statistics that may indicate precociousness. In broad terms, the top three first-crop sires of 2015 and 2016 shared the following: both had at least 90 live first-crop foals (more runners means more earnings); their first book of mares had a collective Comparable Index (CI) of 1.5 or higher and a Class Performance Index (CPI) of at least 2.5; and, at least 28% of first-crop dams were winners at 2. There is one recent exception to the CI/CPI rule and that's Darby Dan's Dialed In—the leading freshman sire of 2016—who had a first book CI of 1.23 and CPI of 2.06. The son of Mineshaft did have other advantages, including the fourth-largest crop among freshman sires in the top 10% by yearling price and was among the top six sires of his class by the percentage of first-crop dams that produced 2-year-old winners (25%). 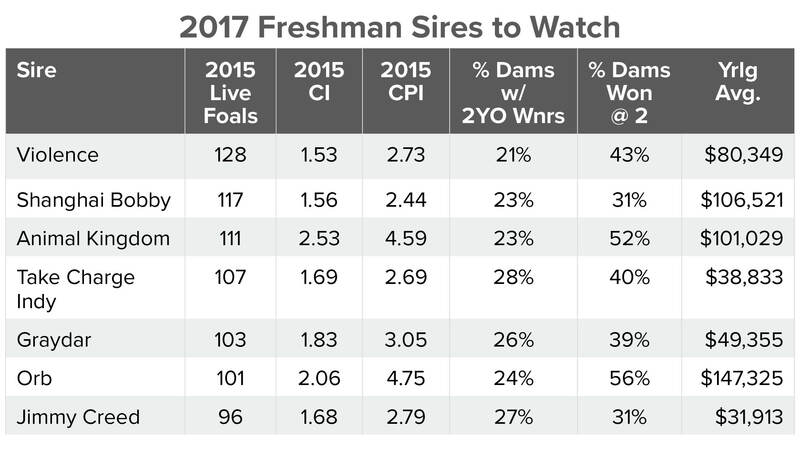 Among 2016's freshman sires only one scored consistently among the top by number of live foals, CI, CPI, percentage of dams with 2-year-old winners, percentage of dams that were winners at 2, and yearling average price. That was Lane's End's Union Rags, who finished as the second-ranked leading freshman sire. For 2015, the only sire who ranked consistently among these same categories was Ashford Stud's Uncle Mo, who was the leading freshman sire and this year's leading second-crop sire. For 2017, again, one sire ranks among the top of these six statistical categories—Claiborne Farm's Orb. The son of Malibu Moon and winner of the 2013 Kentucky Derby Presented by Yum! Brands (G1) had 101 live foals in 2015, a 2.06 CI, 4.75 CPI, 24% dams to produce 2-year-old winners, 56% dams that won at 2, and a yearling average exceeding $147,000. Based on their statistical profiles, these other sires bear watching: Taylor Made Stallion's Graydar (103 foals/1.83 CI/3.05 CPI), Darley's Animal Kingdom (111/2.53 CI/4.59 CPI), Hill 'n' Dale Farm's Violence (128/1.53 CI/2.73 CPI, WinStar Farm's Take Charge Indy (107/1.69 CI/2.69 CPI), Ashford Stud's Shanghai Bobby (117/ 1.56 CI/2.44 CPI), and Spendthrift Farm's Jimmy Creed (96/1.68 CI/2.79 CPI). Shanghai Bobby's first dams fall outside the overall CPI minimum and percentage of dams to produce 2-year-old winners seen among previous leading first-crop sires, but he has a solid percentage of dams that won at 2 and may have an edge as 2012 champion 2-year-old colt. The son of Harlan's Holiday will have plenty of opportunity with 117 first-crop foals.